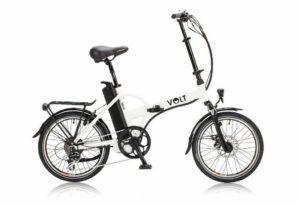 The Volt Metro Folding Electric Bike (Learn More Here!) is one of the most lightweight electric bikes on the market, so you can guarantee you are going to have the ultimate experience when travelling. The Volt Metro is pretty expensive but with the hundreds of positive reviews that can be found on the internet surely makes this electric bike well worth buying. This Volt Metro Electric Bike certainly looks the part with its white modern design; you will certainly have heads turning when cycling past people effortlessly. In terms of reliability and long lasting, this bike has it all and will make your journeys enjoyable, wherever you plan on heading. Pannier rack – The pannier rack is a handy feature for most electric bikes these days and this bike also comes fully equipped with one. It is used for shopping and holds other items of interested so you can concentrate on travelling without worrying about carrying any additional weights on your arms. Long distance travel – This electric bike is well-known for its lightweight structure and that has a positive impact on its ability to travel long distances. This bike can travel around 60+ miles when assisted, making it one of the longest ranged electric bikes around. This is the perfect range for anyone looking to keep fit on a daily basis as it won’t need to be charged that much. Lightweight – The Volt Metro is the second lightest electric bike in the UK, only second to its sister the Metro LS, also manufactured by Volt. Being lightweight has many benefits such as being able to travel longer distances and providing much more power thanks to its motor. Another benefit would also be that it provides a much easier cycling experience for the user. LCD Display – The LCD display that comes with this Volt Metro Electric Bike is one of the most useful features available. It displays plenty of statistics for the user to take advantage of such as distance travelled, speed, battery left, and plenty of other important statistics. This is great for those wanting to keep track of all of their travelling and exercising stats. Bafang power motor – The bafang power motor can be found on a variety of electric bikes in the industry thanks to its quality performance. This electric bike is fitted with the 250W bafang power motor that will ensure you get to all of your destinations quicker without using as much power consumption. 2 year warranty – This bike comes with an amazing 2 year warranty which just goes to show how confident the Volt brand is of this product. The product is sturdy and long-lasting so the chances of you getting any problems with it are slim, but just in case you do, you have peace of mind knowing you have 2 years warranty to take advantage of if you need it. Foldable – The Volt Metro was designed to be as lightweight as possible with folding capabilities, and Volt has achieved that with this electric bike. Its folding capabilities mean it can put in the boot of a car or stored in a cupboard as it doesn’t take up much room at all. V-wave pedal assist – This Volt Metro Electric Bike comes with V-wave technology which helps power assist you to your destinations. The technology included with the V-wave is by far the best power assisted system around. This technology basically ensures users are in full control of their ride and can adjust between 5 different levels of power or none at all if they want to ride manually. Velo comfort suspension saddle – Volt always wanted to manufacture a bike that was comfortable to ride on all terrains and with the introduction of their Velo Comfort Suspension Saddle they have managed to do just that. Front suspension – This bike comes with a front suspension so no matter what terrain you ride on your body weight will be catered for. This is also a handy feature to keep the tyres in good knick for the foreseeable future. Lithium polymer battery – The introduction of the lithium polymer battery ensures the Volt Metro can last a lot longer than other electric bikes in the industry. The technology used also means that the battery can be charged quicker and it has a much longer lasting lifespan. Another benefit of using a lithium polymer battery is that it doesn’t have an adverse effect on the environment. Shimano gears – The implementation of the Shimano gears brand is what helps you take control of the terrain you ride on. With the variety of 8 speed gears you can be sure you have a gear for all terrains you ride on no matter how steep they are. Tektro brakes – The high performance Tekro brakes will ensure you stop in quick time and that you are always safe when riding. These brakes are long lasting and will make sure your tyres stay in better shape. Front and rear lights – Spanninga Dutch front and rear lights will keep you safe during the darker hours. These are also great lights for foggy conditions and are mandatory for anybody riding on a daily basis. Quick release wires – This bike comes with quick release wires which can be removed with ease so users can maintain the bike. This is just another one of the many handy features this bike consists of so anyone that buys this bike doesn’t have an excuse not to keep it clean and tidy. UK manufactured – This Volt Metro Electric Bike was designed and manufactured in the UK so you know exactly where you are buying it from. This has many advantages for you in terms of quick delivery and much better support that isn’t going to cost you anything. As you can see from above, this electric bike has everything from quick release wires to a full on LCD display that shows the all-important statistics. This product was manufactured in the UK which is just another reason to buy it, and along with the fact you get 2 years warranty with the purchase you will have own peace of mind knowing you are in safe hands. In terms of price, this bike is high-end and one of the most expensive electric bikes on the market, but when you compare it with its competitors you will quickly find this bike has a lot more to offer, so it all depends on what you want to spend. All in all, if you are looking for a quality electric bike that is going to do everything you want it to, the Volt Metro Folding Electric Bike should definitely be considered.